In this section, you will find information and resources on risk management and insurance. Risk management refers to the practice of identifying potential risks in advance, analyzing those risks, and taking precautionary steps to reduce or to curb the risk. You will want to take a proactive approach to your organization's operations and seek to avoid or reduce risks and losses in the first place. For example, if your organization has a paid driver who provides door-through-door or arm-to-arm service, it is important that you notify your insurance company of these activities and ensure that you have the appropriate coverage. 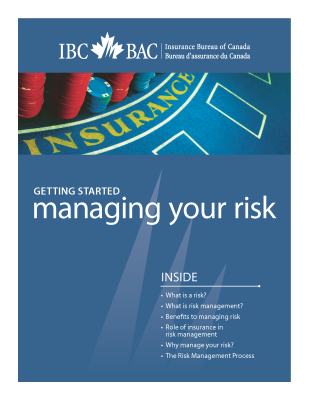 The Insurance Bureau of Canada has put together a valuable resource containing information on risk management including the benefits, the role of insurance, reasons to manage risk, and the risk management process. Insurance is an important part of your organization’s risk management process. Your organization’s insurance needs will vary depending on your assets, activities, and type of service provided (e.g., if you have a paid driver who provides door-through-door service). Some insurance companies group non-profit and for-profit organizations together under the commercial insurance banner as they often carry the same risks and require the same coverage. It is important to consult your insurance company and notify them of your organization’s activities to ensure you have appropriate coverage. Life insurance: Protects your family in the event that something happens to you. This is especially important in the case of a sole proprietorship, because the owner is personally liable for all the debts of the business. Disability insurance: Will provide you with income for a specified period of time, if you are unable to work due to an injury or illness. Partnership insurance or buy-sell insurance: If your business partner passes away, partnership insurance will allow you to purchase the shares and continue running the business. Critical illness insurance: Provides you with a lump sum benefit, if you are diagnosed with a critical illness. Key person insurance: If you rely on certain key people to help run your business, protect yourself against the loss of these key employees. Property insurance: Property insurance will cover the property and buildings owned by your business in the event of destruction or damage due to things like fire and other perils. Contents insurance: This covers assets that you store at your business premises. If you are leasing space for your business, the owner of the property probably has property insurance, but you are likely responsible for your own contents insurance. If you run your business out of your home, you will likely need separate contents insurance for your business assets. Business interruption insurance: If you need to shut down your business temporarily due to a fire or other peril, business interruption insurance will cover your loss of earnings until you are back in business. Automobile insurance: You will need to insure any vehicles that your business owns. If you use personal vehicles for business purposes, be sure to advise your insurance company. Cyber liability: Protects in the event of a lawsuit stemming from an electronic security breach involving compromised personal or commercial information. Can include situations relating to the theft of devices containing organizational, client, employee, or similar data. In Alberta, it is required by law that the owner of the vehicle (e.g., employee, volunteer, organization) has their own automobile insurance. Owned Automobile: If your organization owns vehicles, you are required to have owned automobile coverage. The Standard Endorsement Form (S.E.F.) 6c is the Public Passenger Vehicles Endorsement, which grants permission to use the vehicle to carry passengers for compensation or hire. Non-Owned Automobile: While your organization cannot insure any vehicles it does not own (e.g., employee or volunteer), your organization can purchase non-owned automobile insurance. This insurance protects your organization against liabilities connected to any individual or company using a vehicle to undertake work for your organization. Employees should notify their insurance companies if they use their personal vehicle for business purposes. Volunteers do not have to notify their insurance companies if they use their personal vehicle as part of their volunteer work, as it is not considered business use. However, if the use of their personal vehicle for volunteering is more than occasional, volunteers should consult their insurance broker or agent. Employees or volunteers who use their personal vehicles to occasionally transport clients do not need the S.E.F. 6c endorsement to their personal autombile insurance policy, even if they are rimbursed for mileage and expenses. The Alberta Voluntary Sector Insurance Council has produced a valuable resource on the common types of insurance coverage for not-for-profits and charities, on how to assess your organization's insurance needs, how to choose a broker or an agent, how to manage your insurance program, and how to work with your Board on insurance issues. The Insurance Bureau of Canada has numerous resources available on their website on Business Insurance (http://www.ibc.ca/ab/business/). 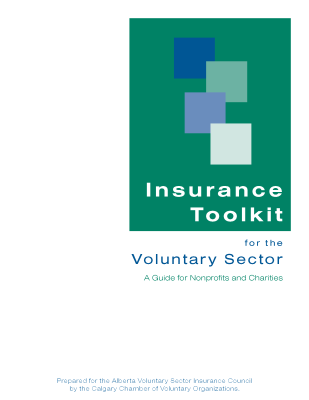 The Insurance for Voluntary Organizations contains a Q&A on common non-profit insurance questions. 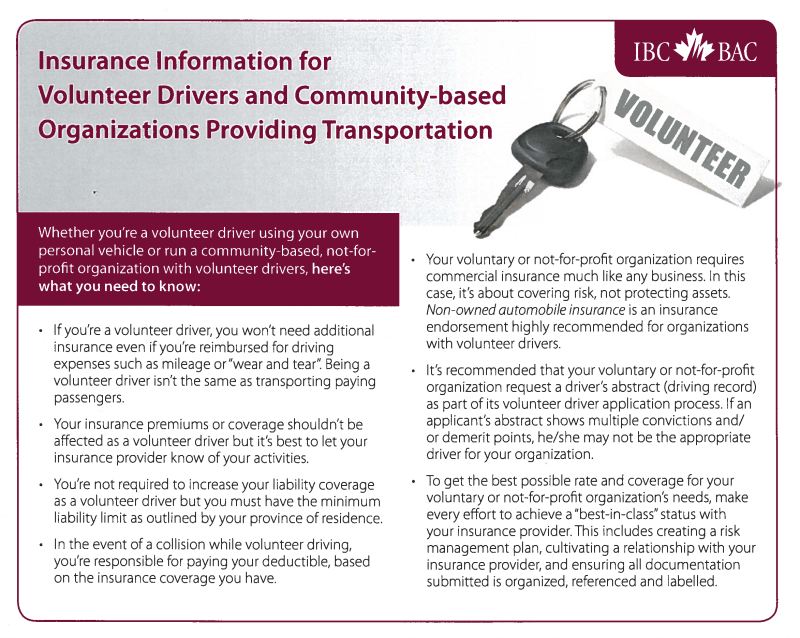 The Insurance Information for Volunteer Drivers (below) outlines what is and isn’t required insurance-wise for volunteer drivers. The IBC is also available to answer any insurance related questions your organization may have. Please contact them at 1-800-377-6378 (toll free). The Edmonton Seniors Coordinating Council and the Medically At-Risk Driver Centre, 2018. 1) One of our volunteer drivers got in an accident with their own car (fault not yet determined). Make sure the volunteer driver reports the Motor Vehicle Accident (MVA) to their insurer. With respect to insurance, what do we do? Set up an incident report so you know what happened. Include any injuries to clients. With respect to insurance, what do they do? Make sure the volutneer driver files an AB-1 under the driver's insurance contract within 10 days of the MVA. An AB-1 form is a Notice of Loss and Proof of Claim Form . 2) One of our volunteer drivers got in an accident with our car​ (fault not yet determined). Report the MVA to your insurer. Keep an incident report including injuries to the driver and passenger. Make sure the driver and passenger file an AB-1 report to your insurance company within 10 days of the MVA. 3) How much liability does our organization need with Non-Owned Automobile insurance? Why is Non-Owned Automobile Insurance important to have? 4) What is the minimum Commercial General Liability limit that an organization needs? 5) What is umbrella liability? Does our organization need it? 6) How much umbrella liability does an organization need? Why is this important to have? 7) If an organization has a Policy/Best Practices manual in place for volunteer drivers, will this lessen the organization's insurance costs? 8) With volunteer drivers and a driver's abstract, what is considered an acceptable demerit point limit for the volunteer driver? If a volunteer has demerit points, what can they do?